Joey Muthengi´s BetIn co-ambassador, McDonald Mariga has shared with the world stunning photos of her all grown daughter that has filled the Internet with love. Black is beauty, no doubt! The former Harambee Stars player shares this shortly after being a part of BetIn´s black-tie event that was lit. Mariga might have ran short of words, but his love for his princess is overflowing. Feedback Kenyans flooded his Instagram page with ´gifts´ that speak nothing short of love: Duh! binti a,ekuwa, hongera @Mc Mariga ❤she´s so pretty She´s royal So cute luks humble lyk de father Beautiful girl! Can´t believe how tall she is now ! ❤️ @mariga77 Beautiful ❤️❤️ Yooo beautiful  @mariga77 princess & glamour She´s adorable  The current Spain´s Real Zaragoza´s player love for her daughter can all be seen in black and white. The Father-daughter relationship is goals to many. 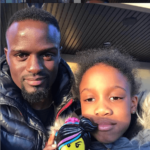 The post Photos: McDonald Mariga´s all grown adorable daughter lights up the Internet with love appeared first on Ghafla! Kenya.